Thrill to the legendary pulp exploits of DC Comics' "First Wave" crimebuster as the Man of Bronze returns in two action-packed adventures by Lester Dent writing as "Kenneth Robeson." First, when mysterious earth tremors endanger New York's hydroelectric dams, Doc must unearth the strange secret of The Roar Devil. Then, Doc Savage is jailed and charged with murder while investigating oil pipeline sabotage in Arkansas. 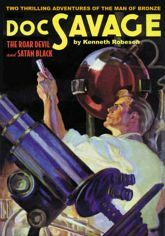 This classic pulp reprint features the original color pulp covers by Walter Baumhofer and Modest Stein, Paul Orban's classic interior illustrations and historical commentary by Will Murray, writer of seven Doc Savage novels. Softcover. 7x10. 112 Pages. Black & White with color cover.